One of Lollapalooza’s stand out performances this year was from Swedish singer/songwriter Tove Lo. And while everyone wants to talk body with one of pop’s biggest rising stars, we wanted to talk music festivals. So a day after her huge performance in Chicago for Lollapalooza, we sat down with the ‘Talking Body’ singer to talk about her recent festival performances and some of her favorite moments at music festivals. Friday of Lollapalooza this year, before fans were treated to headlining performances from Paul McCartney and The Weekend, festival goers rushed (or sprinted if you will) to the Sprint Stage see to Tove Lo perform some of her biggest tracks from her 2014 Queen of the Clouds album. 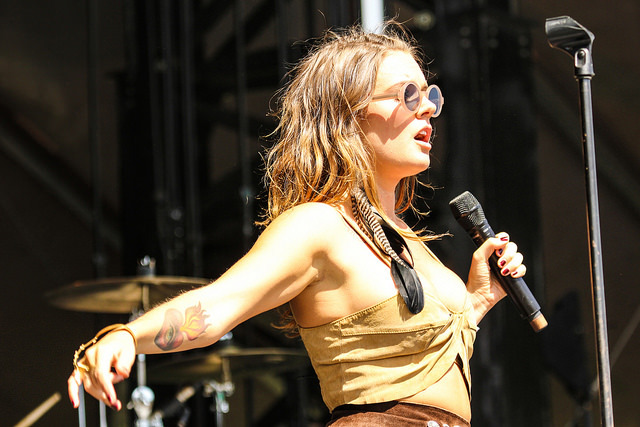 After we congratulated her on the great set, we asked Tove Lo about her weekend at Lolla. “I think it’s awesome!” she told us. “I love the whole set up here. You have this big nature park and then you just see all the skyscrapers around, it’s so cool.” And while Tove was busy in Chicago with her Lolla set, as well as performing one of the festival’s official aftershows, she still found time to take it all it and enjoy the fest. “I watched The Weeknd yesterday… So amazing. Great acts playing and I love my set. So far it’s been awesome.” Next on her schedule of acts to see were Banks, Chet Faker, Sam Smith, Alesso, and more that she couldn’t remember. “I have my little map (of acts to see),” she laughed. Performing two different types of shows during the weekend of Lollapalooza, the festival crowd and her own crowd during a intimate club performance in Chicago, we asked Tove how she compares the two experiences. “It’s one thing when you’re in a club and it’s only your audience, and they know every word, you’re sweating, and it’s intense,” she told us. Not only enjoying festivals as an artist, Tove Lo likes to enjoy festivals as a fan as well. “As a goer (my favorite moment) was when I saw Stromae at Coachella this year. It was the best live show I’ve ever seen, he was just incredible. You could really feel every person in the audience watching his every move, it was great!” And while Stromae is Tove Lo’s favorite live performer, likely one of your favorite artists is a huge fan of Tove Lo’s live performances. Seeing her live twice this year (Bonnaroo and Lollapalooza), her festival performances always rank as one of the best that year. This Swedish pop star is taking over America’s radio waves and the festival circuit, and rightfully so, no one has a problem with it.